Horror Realm is pleased to announce an expansion of its annual Horror Fan Flea Market in time for its fifth anniversary. The event is a way for horror fans to clean out their stash of movies, books, posters, figures, etc. and make sure they find a loving home with other horror fans. The event will be moving to a new venue and expanding to include craft vendors and artists. 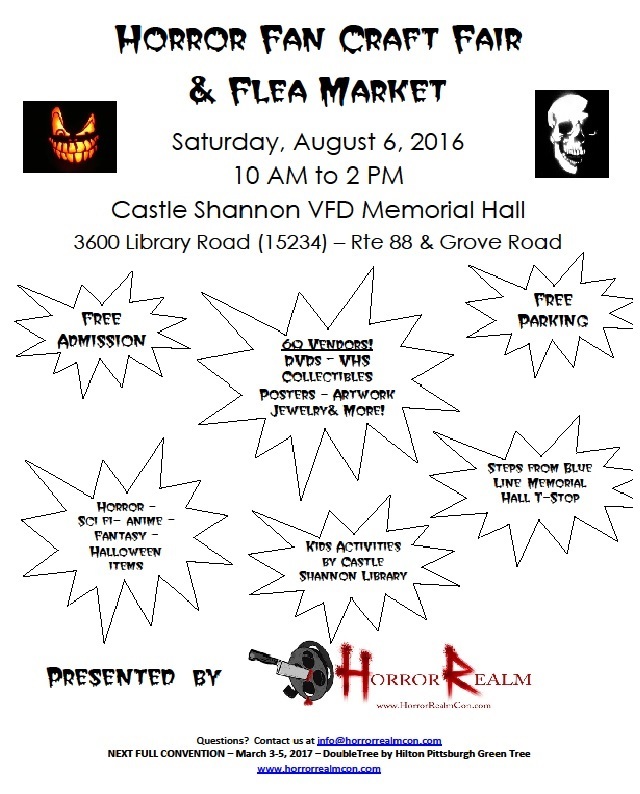 The Community Library of Castle Shannon will be on hand with special activities for children. Admission and parking are free and the event is open to all ages. The hall is steps away from the Memorial Hall T-Station on the Port Authority’s Blue Line. The fire hall is conveniently located at 3600 Library Road, Pittsburgh PA 15234, at the intersection of Library Road (Route 88) and Grove Road. Horror Realm’s next full weekend convention will take place March 3-5, 2017 at the DoubleTree by Hilton Pittsburgh Green Tree. For information on guests, tickets and hotel rooms, please visit www.horrorrealmcon.com.